I have to admit it, initially we chose to go to Indonesia not for its spectacular food but rather for its nature and adventure potential. When we were trying to choose which island to focus our travels on, we wanted the path less traveled and Sumatra became a candidate. Sumatra, beautiful, wild and delicious! We finally settled on it not just because of adventure but because contrary to all popular belief, Sumatra was supposed to have the best food in all of Indonesia. Could it be true? We figured there's only one way to find out so we booked our ferry and plane tickets to our first destination in Sumatra: Padang. As a city, Padang is just "meh" and surprisingly expensive. Like $30 dollars for a shared room expensive. Turns out Padang is the launching point to the surfing mecca at the Mentawai islands and prices are hyper inflated. 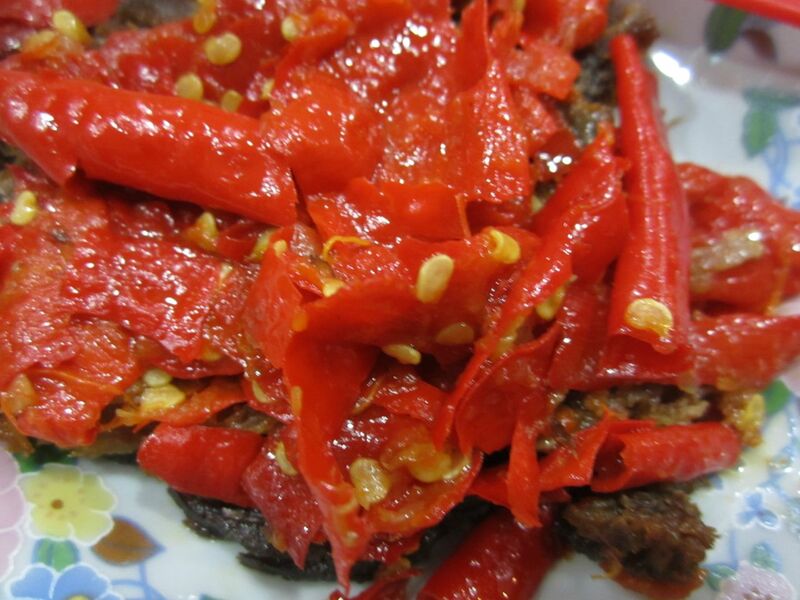 The saving grace for the city is that supposedly, it has the spiciest food in Indonesia. That's definitely something to get really excited about! But wait, it's Ramadan, will there even be anything to eat? Yes. Oh yes there was. We got the impression that Muslims in Padang are pretty chill about the whole Ramadan thing as we saw hoards of them 'cheating' and eating throughout the day. Good news for us! Our first stop was a coconut stand on the side of the road prior to arriving at our hotel. After a long flight, a nice juicy coconut was exactly what we needed. Pile on the goodies please! We then walked over to one of the best restaurants in Padang (according to our guesthouse) and just drooled as the waitstaff piled plate after plate of all sorts of dishes all smothered in bright red hot chilies: braised tofu, beef, potatoes, fish, dry beef, curry beef, yellow chicken, saucy chicken, silken tofu, eggplant and boiled eggs among many, many others. 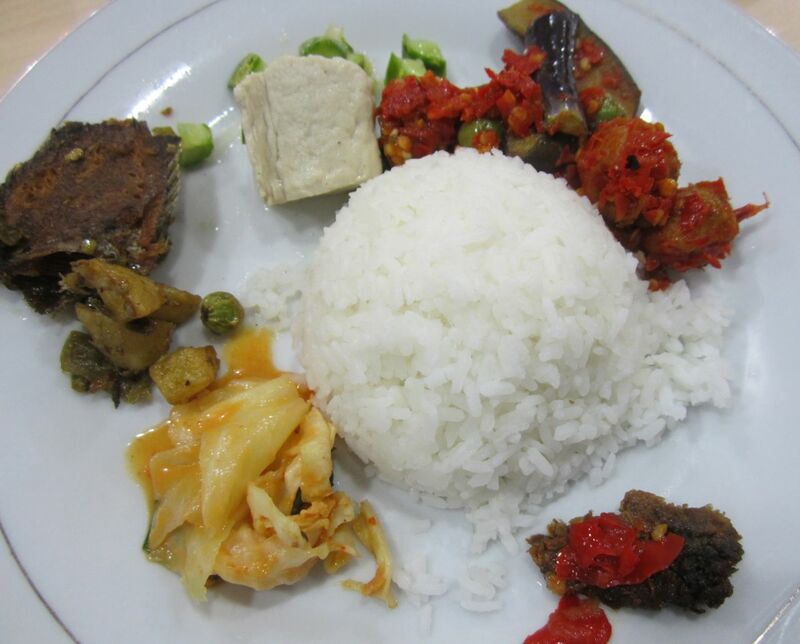 This amazing dish pile is apparently called Nasi Padang. YUM! 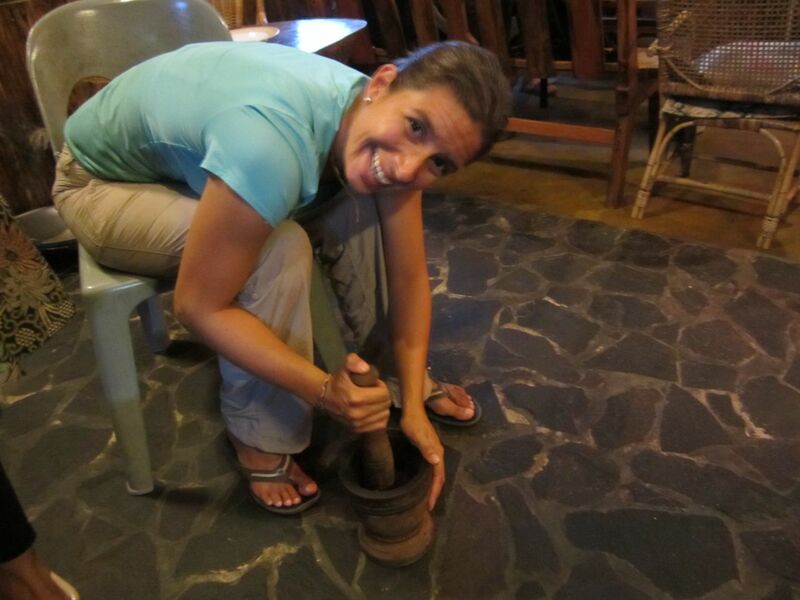 Similar to Ethiopia, the custom in Padang is just to dig in with your hands and enjoy. We didn't realize that you don't really get to "order" your food, instead they just pile it on and you ask them to take away the reject plates. Naturally, we just tried eating everything on the table until we were stuffed beyond belief. The favorite was definitely the Beef Rendang, tender chunks of beef cooked in a toasted coconut sauce. We tried ordering more of it but they had just run out and the three of us nearly fought over the last little piece. A close second was a deep fried spicy fish that felt more like fish jerky but was so crisp that you could even eat all the bones. We only ended up staying in Padang for a short day and decided to hit up the dinner spot once more for lunch before heading out to the airport. At 1pm, the place was packed with locals and there was even a live band playing. You wouldn't have known it because the whole city looks like it shuts down between sunrise and sunset but luckily for us, the restaurant was definitely open, you just had to know to pull away the curtain and slip in through the very narrow entrance. Apparently in Padang, not even Ramadan stops people from eating and given how delightful the food was, it's no wonder!! While Padang was quite the exciting food city, we were shocked to discover one of Sumatra's best kept culinary secrets: the Batak people in Lake Toba are food geniuses!! One of my good travel buddies from Spain even commented how she does not like Indonesian food at all but Batak food was really good! I think one of the tricks to this simple but delicious food is the lake itself. 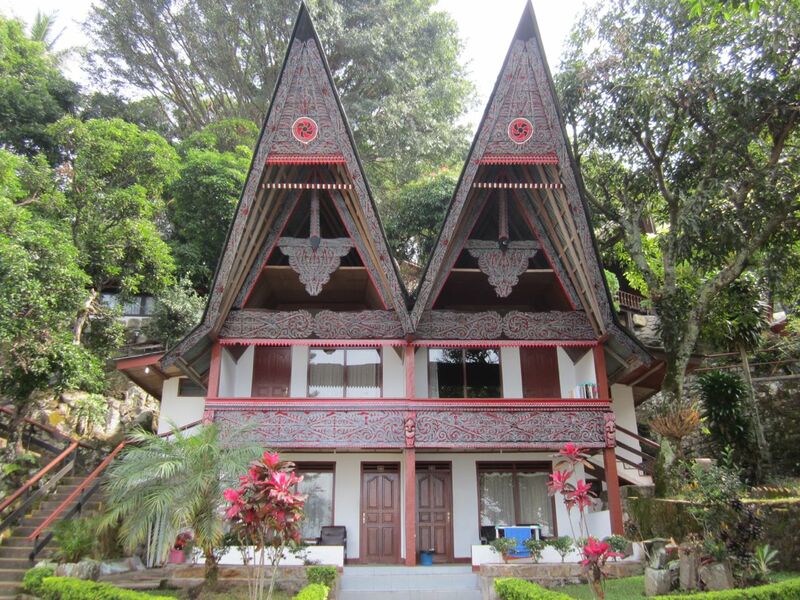 Lake Toba, a few hours west of Medan, is a gem of a place. The depth of the lake (almost 1 kilometer!) helps to keep the water clean and is home to delicious fish. 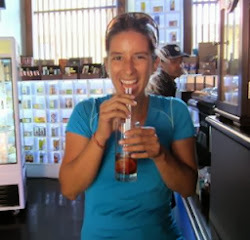 We walked into a small hole-in-the wall restaurant for a late lunch, hoping they would serve us food. They were happy to have us and we all decided to order their fried fish. 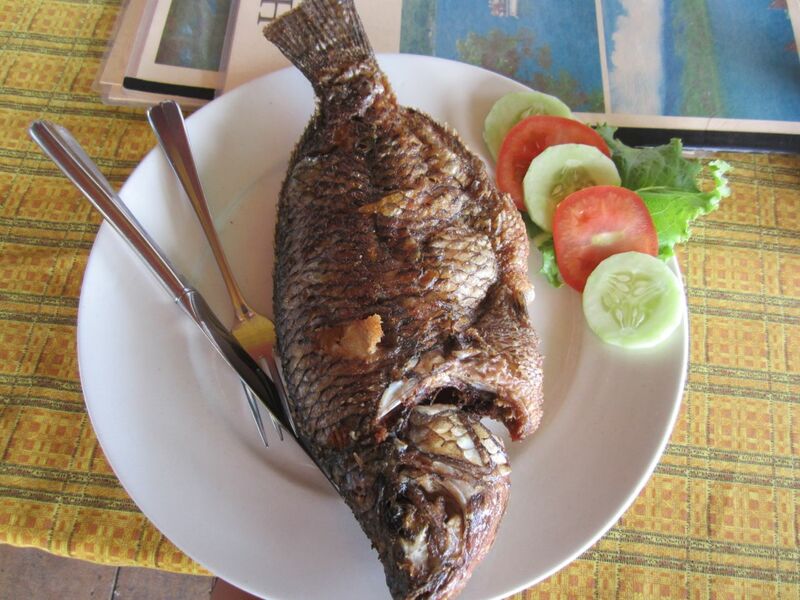 As is typical in most developing countries, our fish was deep fried whole and served with some veggie garnishes. We weren't expecting much but as soon as we took the first bite, we looked at each other all wide-eyed and almost simultaneously went "mmmmmmm!!!!!!!!" The fish had definitely just been caught that morning and our hosts clearly knew what they were doing because it wasn't that greasy, which probably means they heat up the oil just right: even the tail was crunchy enough to eat it all! As a Colombian, deep fried whole fish is just one of those things you grow up with and the ability to eat the tail of the fish so that it feels like a potato chip is a true sign of excellence in the kitchen (my dad taught me this when I was probably 5 years old). Anyway, "Shugary Restaurant" is a must if you ever find yourself in Tuk Tuk. 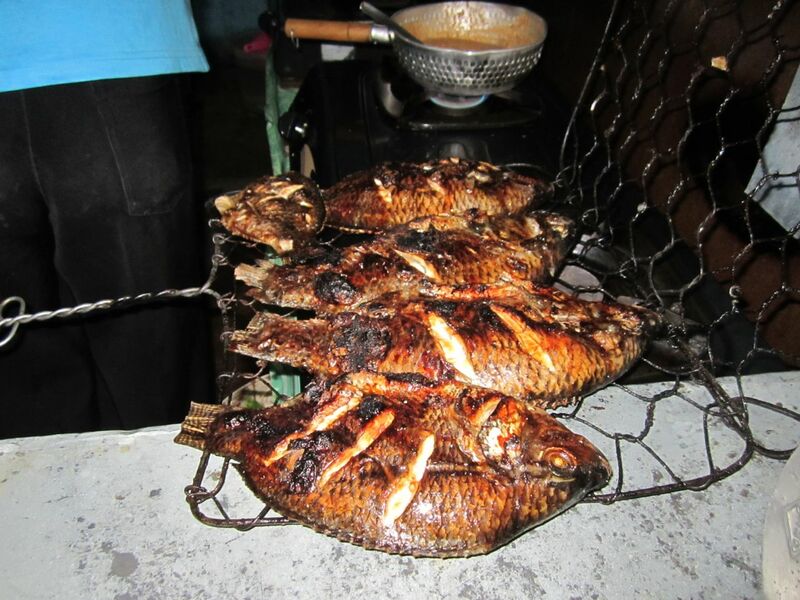 The fried fish was topped by our chef's dinner the next day: slow cooked whole fish on the barbecue. The chef made a little BBQ brush out of lemongrass he used to keep the fish moist with home-made marinade as it cooked for almost an hour. His wife fixes a great veggie salad (with cheese!) 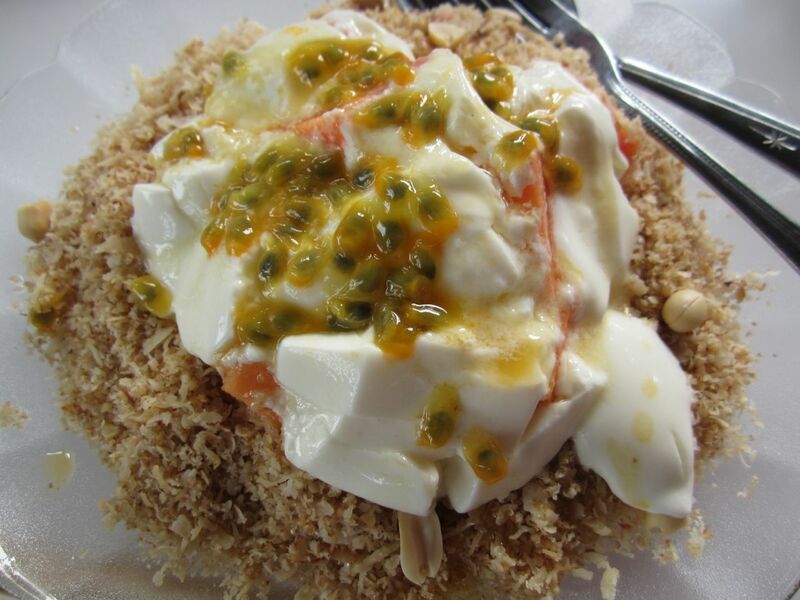 and she makes toasted coconut from scratch, which she then uses to top off a fruit salad with passion fruit. Shredding coconut is a very laborious process and actually a great arm work out. My friend Jamie and I took a cooking class in Tuk Tuk and we had a first hand experience on how tiring this process is! 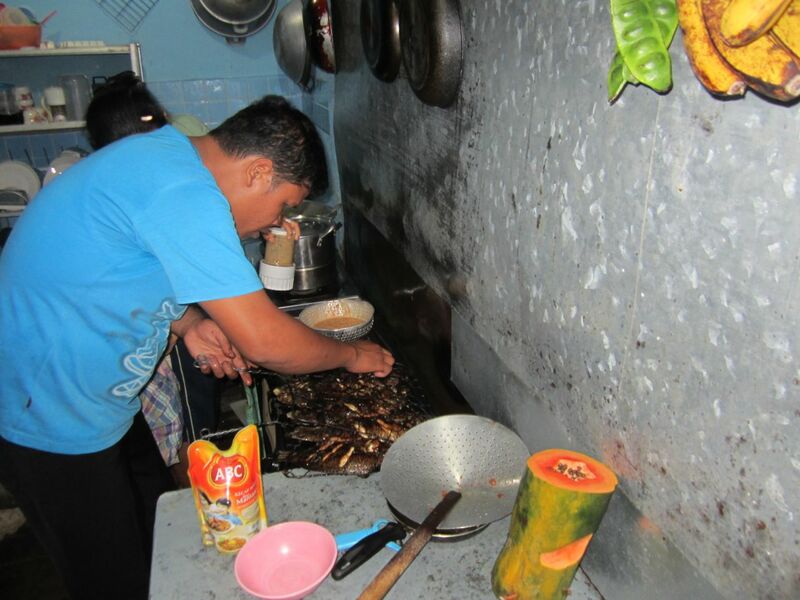 But, regardless, making things from scratch is probably the other secret to Batak cuisine. 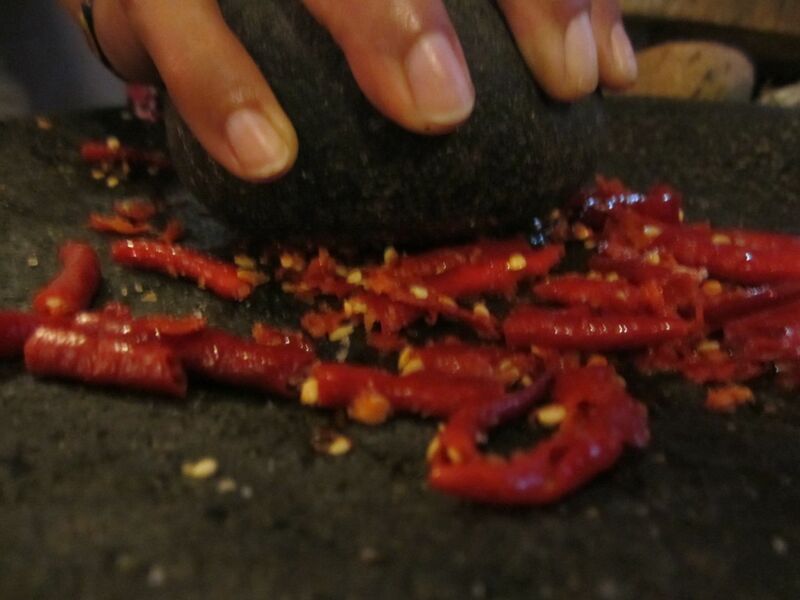 We learned to make sambal (like a chili paste) from scratch without the use of any electronic devices: we used a good ol' round stone and stone tablet to grind chili, garlic and shallot into a deliciously spicy paste. 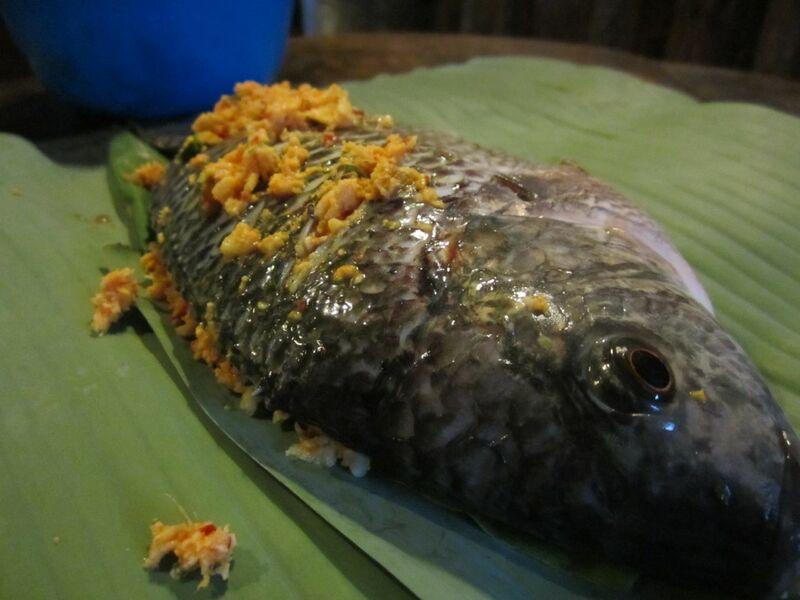 I learned to wrap fish in banana leaves to trap all the flavor and moisture as it steams. We also used heaps of the ground coconut to make our own coconut milk and used a mortar and pestle to make a coconut paste we used for a chicken Rendang. Similar to beef Rendang, we coated pieces of chicken in a toasted coconut paste and slowly cooked them until tender perfection! 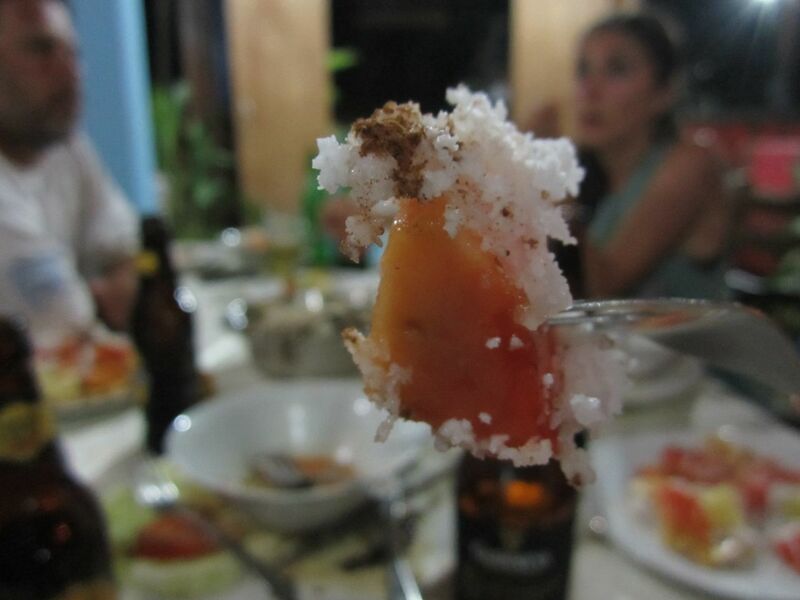 What do you do with all that ground coconut? 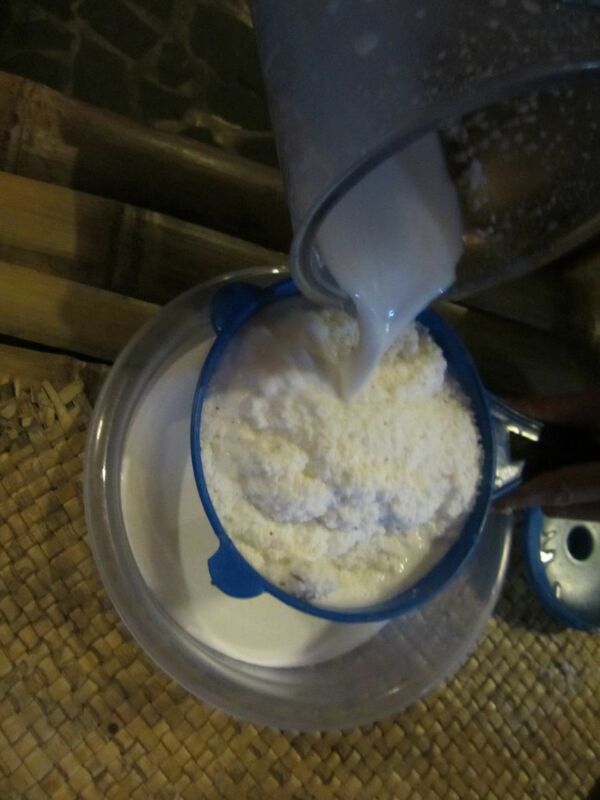 Make coconut milk, of course! I enjoyed finding and reading your blog! Thanks for sharing your comment afastar and let me know if there are any other posts you think I could share. 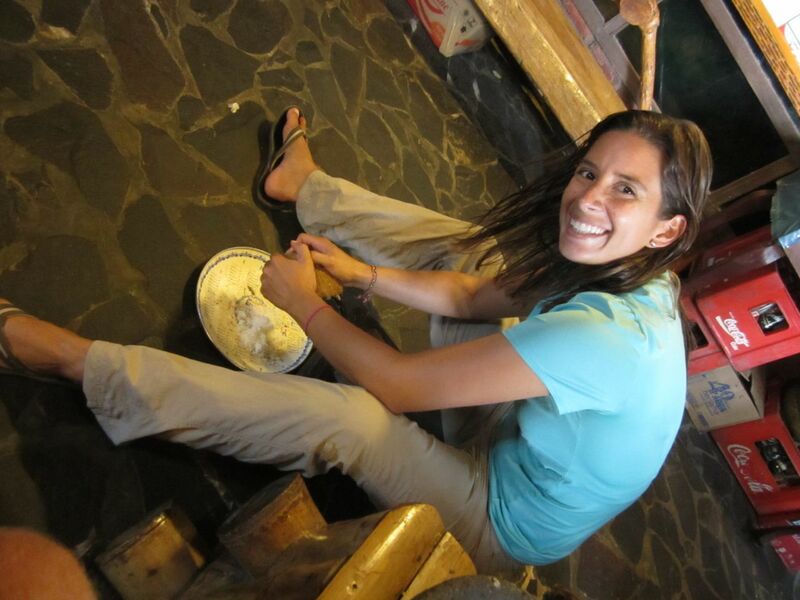 I am a foodie and I love to explore the world, to trek, eat and go on wild adventures! The World's Healthiest "Carb"? A Close Look at Injera, the national food of Ethiopia. You say you like Ethiopian food? Wait 'til you read THIS! The food adventures continue in California!